(Nanowerk News) RIKEN researchers have demonstrated the importance of the interface between two organic materials in maximizing the generation of useful current, providing new insight that could help improve the efficiency of polymer solar cells ("Dominant Effects of First Monolayer Energetics at Donor/Acceptor Interfaces on Organic Photovoltaics"). Improving the efficiency of solar cells requires an intimate understanding of what happens when light strikes a material. Most semiconductor-based photovoltaic devices have essentially the same operating principle: light absorbed by the active material creates an electron and a positively charged counterpart, known as a hole. For a current to flow, these two charges must move in opposite directions (Fig. 1), which is difficult to achieve in organic semiconductors. Previous studies had looked at various mechanisms for weakening the attraction between charge pairs at the interface, but experimental studies provided contradictory results. The results of these studies suggest, however, that the secret lies in the molecular detail at the donor–acceptor interface. 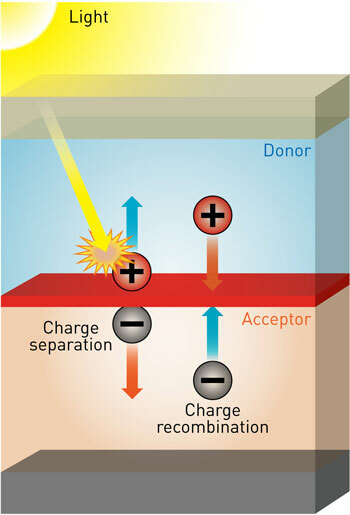 Tajima, working with his colleagues from the RIKEN Center for Emergent Matter Science and the University of Tokyo, attempted to get a better understanding of this problem by carefully controlling the energy levels in the vicinity of donor–acceptor interfaces. Using a contact film transfer method, the researchers were able to stick the donor and acceptor films together at room temperature without using organic solvents to give the well-defined interfaces needed for the experiment.